Veritas comes from the latin root verus, meaning “true, proper, and just”. Saint Kateri’s life was one transcended by the truth of the Word of God. Truth is the greatest guardian of our faith. 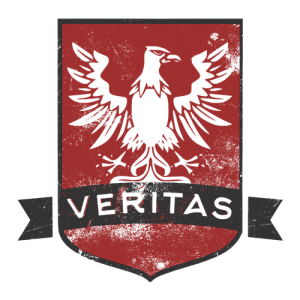 The symbol for Veritas is the eagle, which is emblematic of truth, and reminds us to be ever vigilant. The eagle points his head to the right, reminding us that we must always consider what is to come. This team’s color is red, as depicted historically in heraldry, which represents a warrior’s strength and magnanimity. This symbology serves as an example that truth is the greatest guardian of our faith.